The Powerful Torque range of Electric Screwdrivers (2~18Nm) also utilises the Sumake Brushless Motor design which does not create carbon dust making it ideal for assembling high torque products in a clean-room environment. 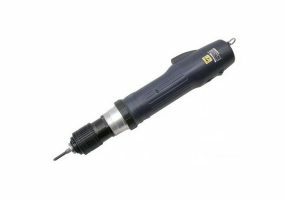 This Electric Screwdriver offers exceptional powerful performance normally found only in pneumatic tools so it can also be used for large sized LED/LCD panels or home appliances. These tools can be suspended from a spring balance to reduce work fatigue and are available as either a lever start (SUEA-BA***L), push start (SUEA-BA***P) or pistol lever start on which you can select lower or upper cable entry (SUEA-BT***LU - upper entry, SUEA-BT***LD - lower entry). All versions feature an easily adjustable external torque control and the SUEA-BA series Powerful Torque Electric Screwdriver is also available with an ESD housing. It is recommended that all of the SUEA-BA series Powerful Torque Electric Screwdriver are used with a Auxiliary Linear Torque Arm (SUEAA-AUXA) to provide stability (a telescoping linear torque arm is also available SUTA-T030). Please note that some models supplied may start with BAN*** instead of the BA*** listed below, this is due to the manufacturer changing the part numbers. Please note that some models supplied may start with BTN*** instead of the BT*** listed below, this is due to the manufacturer changing the part numbers.